The experiment was conducted for two consecutive years across four locations using 16 field pea genotypes. The objective of this paper is to determine the magnitude of genotype by environment interactionand performance stability of genotypes. Analysis of variance (ANOVA), regression of genotype on the environmental mean, AMMI analysis, ASV estimation and GGE biplot analysis were carried out following their respective procedures. Pooled analysis of variance for grain yield showed significance differences among genotypes, environments and G xE interaction. This implied genotypes differently responded to change in environments. Both ASV and AMMI biplot analysis showed the same result in identifying the widely adapted genotypes. Genotypes IG-51700 and SAR-FB-61 were the best adapted ones in this experiment for wide scale recommendation in field pea growing areas while Genotype FP-Milky was better adapted variety in the high potential areas, like Angecha, which is already under production. Based on the GGE biplot analysis, Angecha o4 environment is more discriminating environment than others for the superior genotype selection. Location-wise Waka provided little or no information about the genotypic differences, therefore, should not be considered as test environments for field pea yield trials. Angecha, Hosanna and Bule can be efficiently used for filed pea multi-environment yield trials provided that they are further confirmed by multi-year experimental data. Acikgoz, E., A. Ustun, I. Gul, E. Anlarsal, A.S. Tekeli, I. Nizam, R. Avc?oglu, H. Geren, S. Cakmakci, B. Aydinoglu, C. Yucel, M. Avci, Z. Acar, I. Ayan, A. Uzun, U. Bilgili1, M. Sincik and M. Yavuz, 2009. Genotype x environment interaction and stability analysis for dry matter and seed yield in field pea (Pisum Sativum L.). Spanish J. Agri. Res., 7(1): 96-106. Annicchiarico, P., 2002. Genotype x environment interactions - challenges and opportunities for plant breeding and cultivar recommendations. FAO plant production and protection Paper-174, Rome, Italy. Brink, M. and G. Belay, 2006. Plant resources of tropical Africa: Cereals and pulses. PROTA Foundation / Backhuys Publishers/ CTA. Crop, S., 2009. Crop stat 7.2: Crop research informatics laboratory, International Rice Research Institute, Los Banos, Laguna, Philippines. Crossa, J., P.N. Fox, W.H. Pfeiffer, S. Rajaram and J.H.G. Gauch, 1991. AMMI adjustment for statistical analysis of an international wheat yield trial. Theor. Appl. Genet., 81(1): 27-37. DAFF, 2011. Garden peas (Pisum Sativum) production. Directorate of plant protection, department of agriculture, forestry and fisherise, Pritoria, South Africa. Elzebroek, T. and K. Wind, 2008. Guide to cultivated plants. CAB International, Oxfordshire, UK. Finlay, K.W. and G.N. Wilkinson, 1963. The analysis of adaptation in a plant breeding programme. Aust. J. Agric. Res., 14(6): 742–754. Gauch, H., 2006. Statistical analysis of yield trials by AMMI and GGE. Crop Sci., 46(4): 1488–1500. Gauch, H.G., 1988. Model selection and validation for yield trials with interaction. Biometrics, 44(3): 705–715. Gauch, H.G., 1993. Prediction, parsimony and noise: A model can be more accurate than a data used to build it because it amplifies hidden patterns and discards unwanted noise. American Scientist, 81(5): 468-478. Gruneberg, W., K. Manrique, D. Zhang and M. Hermann, 2005. Genotype x environment interactions for a diverse set of sweet potato clones evaluated across varying ecographic conditions in Peru. Crop Sci., 45(6): 2160-2171. Hartmann, H.T., A.M. Kofranek, V.E. Rubatzky and F. W.J., 1988. Plant science: Growth, development and utilization of cultivated plants. 2nd Edn., Englewood Cliffs, NJ: Prentice Hall Career and Technology. Kandus, M., D. Almorza, R.B. Ronceros and J.C. Salerno, 2010. Statistical models for evaluating the genotype-environment interaction in maize (Zea Mays L.). ?YTON ISSN 0031 9457, 79: 39-46. Kang, M.S., 1993. Simultaneous selection for yield and stability in crop performance trials: Consequences for growers. Agron. J., 85(3): 754-757. Khan, T.N., R.J. French and D.C. Hardie, 1996. Breeding field peas for Western Australia: Progress and problems. Pisium Genetics, South Perth, Australia, 28: 5-12. Malosetti, M., J. Ribaut and E.F.A. Van, 2013. The statistical analysis of multi-environment data: Modelling genotype-by-environment interaction and its genetic basis. Frontiers in Physiology, 4(44): 1-17. Naroui Rad, M.R., M. Abdul Kadir, M.Y. Rafii, Z.E.J. Hawa, M.R. Naghavi and A. Farzaneh, 2013. Genotype x environment interaction by AMMI and GGE biplot analysis in three consecutive generations of wheat (Triticum Aestivum) under normal and drought stress conditions. Australian J. Crop Sci., 7(7): 956-961. Purchase, J.L., H. Hatting and Van Deventer, C.S., 2000. Genotype x environment interaction of winter wheat (T.aestivum) in South Africa: Stability analysis of yield performance. S Afr. J. Plant Soil, 17(3): 101-107. Schneider, K. and L. Anderson, 2010. Yield gap and productivity potential in Ethiopian agriculture: Staple grains & pulses. EPAR Brief, No. 98, University of Washington, USA, . pp: 24. Solomon, A., N. Nigussie and Z. Habitam, 2008. Genotype-environment interaction and stability analysis for grain yield of Maize (Zea Mays) in Ethiopia. Asian J. Plant Sci., 7(2): 163-169. Tolossa, T.T., G. Kenani, T. Sefera, M. Jarso and Y. Bekele, 2013. Genotype x environment interaction and performance stability for grain yield in field pea (Pisum Sativum) genotypes. Int. J. Plant Breed, 7(2): 116-123. Yan, W., 2001. GGE biplot-A windows application for graphical analysis of multi-environment trial data and other types of two-way data. Agron. J., 93(5): 1111–1118. Yan, W., 2002. Singular-value partitioning in biplot analysis of multi-environment trial data. Agron. J., 94(5): 990 -996. Yan, W., M.S. Kang, B.M.S. Woods and P.L. Cornelius, 2007. Gge biplot vs. Ammi analysis of genotype-by-environment data. Crop Sci., 47(2): 643–655. Yan, W. and I. Rajcan, 2002. Biplot analysis of test sites and trait relations of soybean in Ontario. Crop Sci., 42(1): 11-20. Yan, W. and N.A. Tinker, 2006. Biplot analysis of multi-environment trial data: Principles and applications. Can. J. Plant Sci., 86(3): 623–645. Zali, H., E. Farshadfar, S.H. Sabaghpour and R. Karimizadeh, 2012. 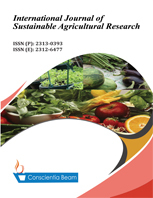 Evaluation of genotype × environment interaction in chickpea using measures of stability from AMMI model. Annals Biol. Res., 3(7): 3126-3136.